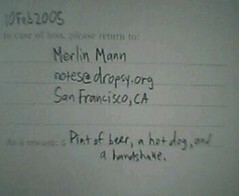 The floor is open: What do you offer “As a reward” in your Moleskine? Or, other way round: what would you need to see on that line to make you want to contact the owner? Update: This idea was unintentionally stolen wholesale from the fine folks at Moleskinerie. I apologize for the oversight, and ask that you kindly also visit their posts, How much is your Moleskine worth? and Care and Feeding.